What does it mean to be Well-Architected? Why should you even consider it? AWS is great at giving you the building blocks for your cloud implementation. In fact, we often use the metaphor of building a house to explain how you can – and should – use AWS to implement and operate your workloads. However, sometimes working with AWS can feel like trying to build a house by walking in to a hardware store; you know all the things you need are in here somewhere but figuring out how they go together is the hard part! You also need to be confident that the decisions you are making will stand the test of time. Many organisations, especially when they get started in AWS, worry about the on-going performance, cost, and security implications of the decisions their teams are making, as they should. This is why the AWS Well-Architected Framework works so well. well as provide guidance to help you improve over time. At Versent we started standardising the Well-Architected Framework late last year as a common approach and language to align our solutions, as well as being consistent with AWS's recommended approach. 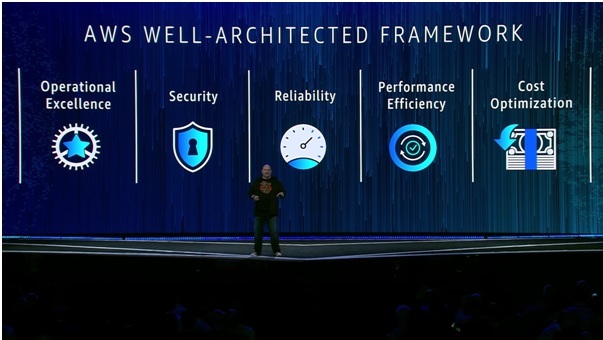 AWS is committed to the Well-Architected Framework as you see below, which was based on the framework's pillars. It is interesting to note that in 2017, the pillar was the first covered in the review. This was recently changed so that the first pillar covered is now, because without proper operational processes even the best security standards will be ineffective. In each of the pillars, there are that help elicit the information needed to review your AWS workload; we’ll talk about AWS reviews in a minute. For each pillar there are design principles that should be considered and address when designing cloud-based implementations. There are both general principles (e.g. "Stop guessing your capacity needs") that apply to all aspects of usage, and pillar-specific principles (e.g. "Perform operations as code"). This will also give you a document of findings that can be used to make improvements to your AWS service. Originally, only AWS Solution Architects could run Well-Architected Reviews. Recently AWS opened this up to a select group of partners so that they can perform reviews. How do you start a Well-Architected review? The review is driven by asking questions about your AWS service. scorecard, they are a measurement. finishing point either. Rather, it is a form of feedback and measurement on your cloud journey. Want Your Own Well-Architected Review? As an AWS Well-Architected Partner, Versent is able to perform Well-Architect Reviews of your AWS-based systems and applications. Get in touch (info@versent.com.au) to arrange a review, or just to have a chat about how we can help with your Amazon application. Rowan is the Cloud Practice Director at Versent, a Serverless Champion, AWS APN Cloud Warrior, and published author on AWS. When he's not using and talking about AWS at work, meetups, or online, he's busy running after his three kids.